Teachers at Lake Elmo Elementary are bringing calm to the classroom. More than 30 teachers have volunteered to take part in a professional development opportunity called Yoga Calm. It's meant to help students deal with stress and anxiety and focus on learning. Read more on our website. Stillwater Area High School sophomore Ian Ruh won the Drake University Physics Prize Test! Four other SAHS students finished in the top ten, including Evan Sand (4), Drew Weigel (6), Josh Albrecht (7) and Adam Markowicz (8). Two others finished in the top twenty: Alex Daum (16) and Marta Markowicz (17). As the winner, Ian was offered a $140,000 four-year, full-tuition scholarship to attend the Iowa school. Read more. Thanks to all of our students and staff who participated in the Minnesota FoodShare March Campaign to Feed a Family. Overall, the St. Croix Valley collected more than 45,000 pounds of food and more than $125,000 in cash donations. Thanks to the generosity of our community, Valley Outreach says their shelves will be stocked through the summer months! Congrats and good luck to the eight student-athletes from Stillwater Area High School who announced they will be playing their sport at the college level! 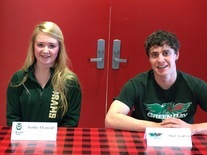 Two students signed Division I letters of intent, three will be playing Division II sports and three will be Division III athletes. Photos on Facebook. Signing up for Adventure Club or Spin this summer? Be sure to sign up by the May 3 deadline! After May 3, the registration fee increases to $40 and all requested days will be considered drop-in care and charged at the drop-in rate. These registrations will be accepted on a space available basis. Sign up online.